Current Release: Acid & Eve on MLXL. Recommendations: Spend some time looking at the paintings by Mark Rothko, housed on the third floor of the Tate Modern in London while listening to Small Hours by John Martyn on repeat. If you enjoyed this interview with Mallorca Lee, visit his facebook page or his website for music, news and everything you ever wanted to know about him. I first started to get really interested in music in the early 80’s when Hip-Hop captured my imagination and made me purchase a terrible set of turntables that had no pitch control. I quickly learned you needed them. I also learned that I needed a sampler to make my own beats and this led me to buy lots of the wrong cheap equipment to try and make my mix tapes. Run DMC and Public Enemy were huge influences, from their productions to stage presence. I definitely rapped in the mirror to these artists songs on more that one occasion when I was a teenager! I was the right age in the late 80’s, going out clubbing as Acid House gripped the nation. I moved away from Hip-Hop and became addicted to dance music culture, which taught me anything was possible. I have very same DIY approach to this day. There was no internet or friends that had “made it” to give me advice or tell me what equipment was needed, I was the kid at the side of the stage, trying to ask the bands / PA’s what equipment I needed to make “dance music”. I didn’t even know there were shops that sold synthesizers and drum machines. My school teachers even laughed at me! When I first saw Adamski LIVE in 1990 I knew what I wanted to do. I got a terrible bank loan and bought an Ensoniq ESQ80 Synthesizer and Sequencer and an Alesis SR 16 drum machine, plugged them, mono into an old guitar amp and started learning to make dance music. Adamski was the artist that showed me you could do it yourself with some keyboards and a drum machine. I couldn’t say I was copying him because my music was no where as good as his early records, I definitely started out trying to emulate his musical style in my bedroom, but never recorded or released any music like this. This was my homework. I quickly found myself submerged in the Rave scene, playing gigs all over the country. I took the attitude of Public Enemy and mixed that with the house music of Adamski and N-Joi to create my first band Ultra-Sonic. Trying to learn how to make music and what tools you needed. I started a band with my brother’s supply schoolteacher, Rodger Hughes, who had a shared interest in syths and house music. I learned a lot from him as he had been doing it a few more years than me. He also had a Yamaha RY30 Drum machine that could play beats that sounded like the records I had been buying, a Roland D10 and a Yamaha V50. We combined our set ups and started making early rave music and playing as “live” as we possibly could. Not knowing or having effects or how to work a mixing desk was as fun as it was frustrating. I think not knowing how to work something and just feeling your way about is great. You learn on your feet and don’t let the science stop you from making a noise. I’ve kept that Punk rock approach and hardly ever read manuals; I just mess about until I am happy with the results. It drives other people nuts but I am happy with my approach. If I were more musical or technical I would just beat myself up more. Recording vocals the first time was also crazy as we had no idea how to go about that. Like many dance producers I started off small in the corner of my room, from a set of turntable I quickly got a Ensoniq ESQ80 Synthesizer and Sequencer and an Alesis SR 16 drum machine. From there I moved to an Ensonique EPS 16+ and that just changed my world. I could sample anything and make a tune, all in this one machine. Having loads of Hip-Hop records helped me get the beats and vocals samples I needed. Getting my first Amiga computer that ran Cubase really opened up the possibilities of song writing as I was never really good at arithmetic and linear sequencing was like being back in school sometimes haha. From there my set up grew, the TR 909 Drum machine and TB 303 baseline were two other land mark purchases in the early 90’s that changed my sound and style. We were making Rave music and were playing all over the world. The more money we got the more equipment we spent it on and I am sorry to say smashed up while touring. The TB303 and TR 909 have always been the main parts of my set up. I think there always has to be the human element in electronic music. I am hands on with my equipment. 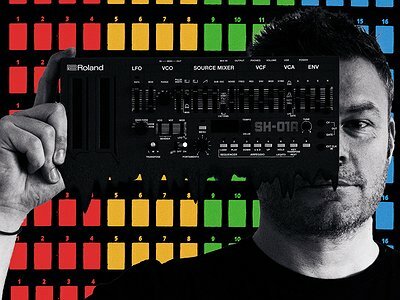 It’s the machines that make it possible for one man to be a band but it’s the human element of tweaking the filters and controlling the builds and drops of the track, along with deciding the tempo. If its done right it’s a marriage made in audio heaven. If its done wrong, it's soulless computer music, that you can hear, lacks the human touch, elevator music. With my latest LP, I specifically went back to sequencing on the machines and not a DAW. I wanted these limitations to have an effect of the music I was creating. What software you use, what instruments you choose all have an effect on your final sound, whether you admit it or not - even if you work with someone. From the noise leaving your head to the final record, the machines you choose to make it with have an effect. If I had written this album on LogicX, it would have been done a lot quicker but would have sounded totally different. I like to work with friends, that’s a big one for me, there has to be a feeling that they want to be involved and get what I am trying to achieve. I have worked with people on a business level and it just does not work for me. If it’s on my record, I like to be in control of what’s going on and have a strong idea of what I would like recorded. If it’s a vocalist I will write the lyrics and record a scratch vocal with melodies, if it’s a guitar part I will hum the parts, then get the players in to play, after I have what I need I then open the recording up to ideas and inputs from the players. As long as we are all into it, magic can happen, if I have to talk someone into it or explain why, I know I am not going to get the performance. If it’s collaboration, I am also happy to sit back and contribute to someone else’s ideas and then we can share the hot seat, but again I need to be comfortable with that person and have a laugh with them outside of the studio. "I like to work with friends. There has to be a feeling that they want to be involved and get what I am trying to achieve. I have worked with people on a business level and it just does not work for me."